The San Francisco 49ers were unable to live up to their high expectations, in part due to starting quarterback Jimmy Garoppolo going down due to injury early in the season. However, there is plenty to be excited about in San Francisco looking forward. 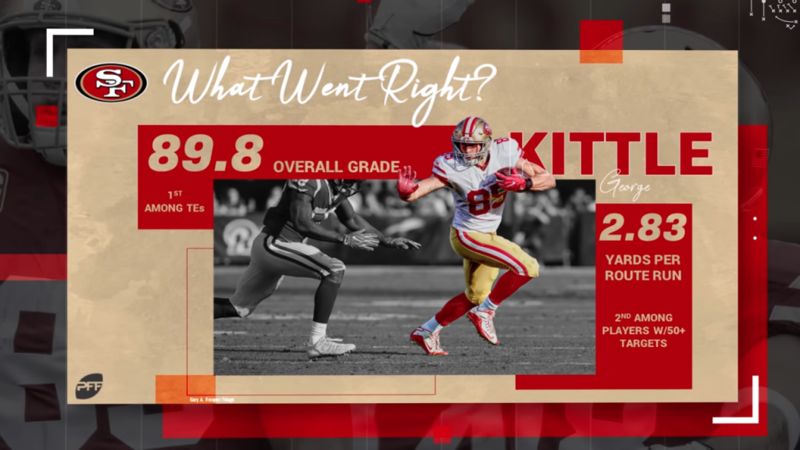 Second-year tight end George Kittle had a breakout season, earning an 89.8 overall grade which led all tight ends. Kittle was also one of the top receiving threats in the league, finishing second behind Julio Jones in yards per route run among all players with at least 50 targets. 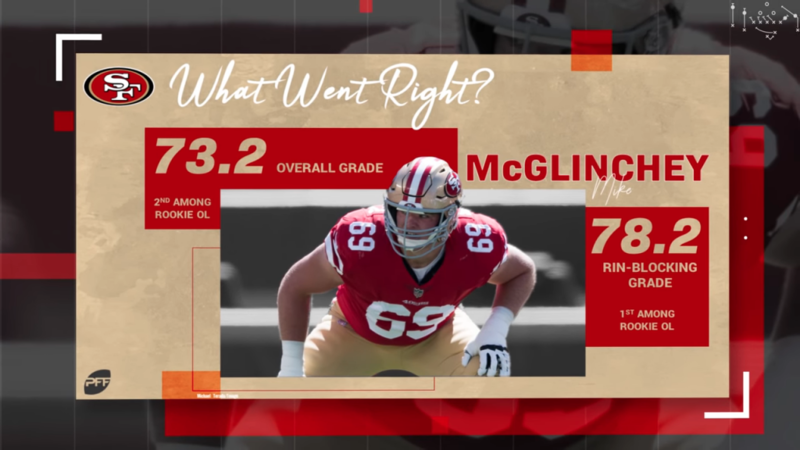 Rookie right tackle Mike McGlinchey paid dividends in his first year with the 49ers; amongst all rookie offensive linemen, McGlinchey was the best run blocker and finished with the second-highest overall grade. DeForest Buckner continued to be the 49ers’ most effective player on defense, finishing with an overall grade of 82.8 on the year. Buckner set a career-high with 55 total pressures, ranking sixth among interior defensive linemen. The quarterback position didn’t pan out how the 49ers had planned after re-signing Jimmy Garoppolo in the offseason. After Garoppolo’s injury in Week 3, both C.J. 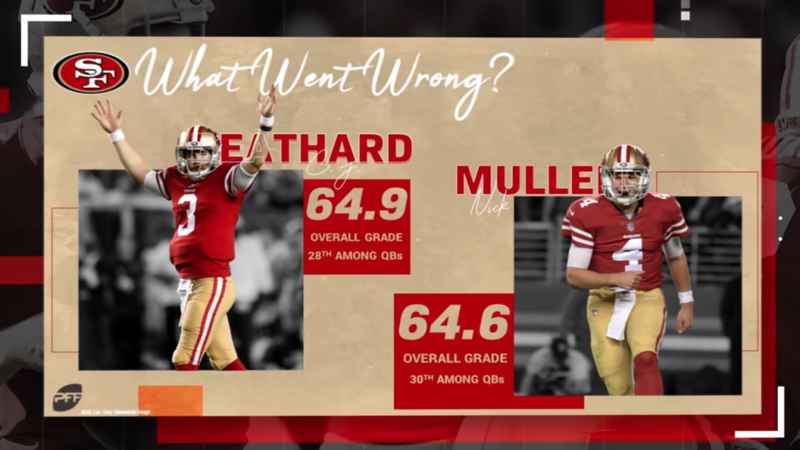 Beathard and Nick Mullens posted mediocre passing grades of 65.5 and 66.7, respectively. Despite signing Richard Sherman this past offseason, the team’s pass defense continued to be a major weakness, finishing last as a team in coverage grading at 37.5. Defensive struggles were a theme for the 49ers this year, and tackling was no different. Their team tackling grade of 43.8 was second-worst in the NFL. Fred Warner showed flashes as a rookie, but he also led the team with 16 missed tackles. Kittle was the highest-graded offensive player, picking up 873 yards after the catch, the most we’ve seen from any position since 2006. He was also excellent as a run blocker, ranking fifth in the league with a 73.3 grade. Buckner took home the top grade on the defense, tying for third among interior defensive linemen with 37 stops. 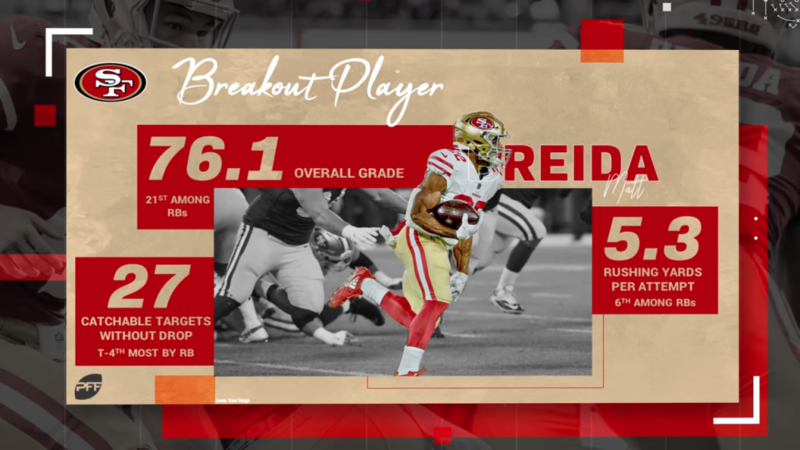 Second-year running back Matt Breida provided a much-needed spark for the 49ers offense. Despite lingering injuries, Breida was effective in both the run and pass game, finishing with an overall grade of 76.1. Breida finished sixth in rushing yards per attempt (5.3) and while also not dropping single pass on 27 catchable targets. Mike McGlinchey not only led all 49ers rookies with an overall grade of 73.2, but he showed his dependability by starting all 16 games in his first year. McGlinchey also proved to be one of the league’s premier run blockers and finished with the fourth-highest run-blocking grade of any lineman in the NFL. The 49ers are armed with some key pieces as they continue to rebuild the roster, and a strong offseason should have them in contention in the NFC West in 2019.